Is the Tea Party Fracturing? With the media coverage predominantly centered on the sense of betrayal felt by many on the Left regarding Obama and the debt deal, it is easy to forget that the debate also divided the Tea Party. In the House, members of the Tea Party caucus split their vote almost evenly, with 32 supporting the debt legislation, and 28 voting against. In an article for the French news agency AFP yesterday, Olivier Knox raised the question whether this split might portend a fracturing of the Tea Party movement heading into the 2012 elections. As I told Olivier, my answer is that I don’t think it will. First, let’s look at the House Tea Party vote. The split doesn’t seem to reflect differences in district-level factors. Anna Esten calculated the average winning vote percentage and the support for Obama for the Tea Party members in 2010. As you can see, there doesn’t seem to be much difference in the district level totals between those who support the debt legislation, and those who opposed it. Instead, the determining factor seems to have been the Tea Party representatives’ ideological leanings, as captured in the scoring of their votes. (The data on ideology in the chart below is taken from Simon Jackman’s website). Although most of the Tea Party caucus members are located in the more conservative half of the Republican caucus, those voting “no” on the debt legislation are, as a whole, much more conservative than those who voted yes. Many of them, echoing Bachmann’s viewpoint, were against raising the debt ceiling without passage of a balanced budget amendment. Bachmann, of course, is positioning herself to capture the Tea Party vote in the Republican presidential nominating process. Here’s Esten’s comparison of the “No” and “Yes” House Tea Party votes. In short, the debt vote notwithstanding, the Tea Party caucus remains united on the need to reduce spending, hold down taxes and balance the budget. I expect that they will coalesce behind a single candidate during the nominating process and in the general election. The debt debate will likely recede from public consciousness and 2012 will primarily be a referendum on jobs, government spending and Obama’s handling of the economy. The more important issue is whether the debt resolution will redound to Obama’s benefit among independent voters. I’ll take that question up when the polling data begins coming in. The recent vote by NAACP delegates in favor of a resolution “to condemn extremist elements within the Tea Party” and “calling on Tea Party leaders to repudiate those in their ranks who use racist language in their signs and speeches” has, predictably, refocused attention among the punditcrats on an issue that we have discussed several times before on this blog. But the most recent batch of commentary is, in my view, missing the real story. What do we make of these findings, including the significant difference in the racial views of Tea Partiers versus non-Tea Partiers, including the “middle of the road” respondents? Note that Parker and his colleagues reject the argument made by some conservatives that racial “resentment” is largely a function of ideology, as opposed to racial views. When they construct an “index” of racial resentment based on answers to these survey questions, and run a regression, they find that being a Tea Party member is a significant predictor of adopting an attitude of racial resentment, even when controlling for ideology and partisanship, as indicated in the following figure. I have some concerns about this study. To begin, I am uncomfortable with the wording of some of the survey questions themselves and whether they are really tapping into “racial resentment” or some other policy dimension. Clearly some of these concerns, such as attitudes toward immigration, have an economic component. 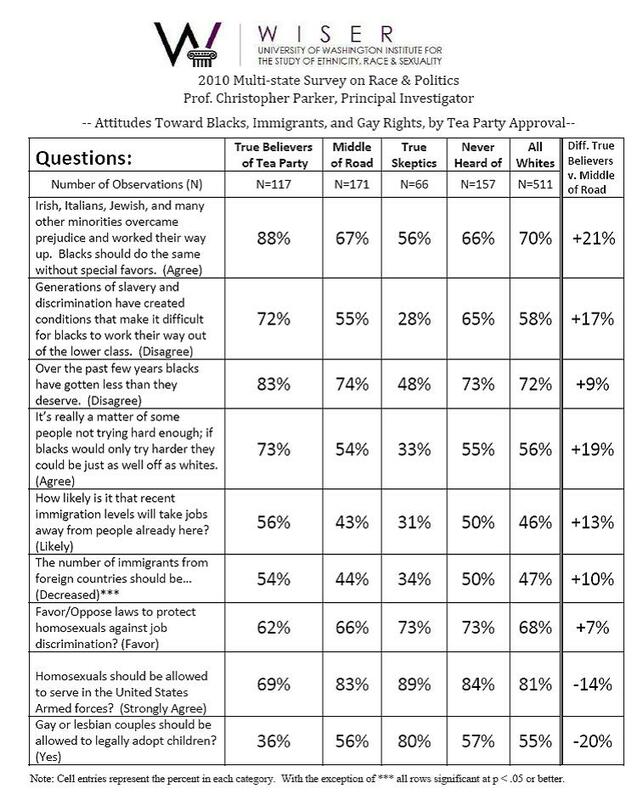 Partly because of my concerns over question wording, and uncertainty regarding just what these questions are measuring, I also wish Parker did not report only the results based on using an index of “racial resentment” as his dependent variable when trying to gauge the relative importance of Tea Party support, ideology and partisanship on holding racially resentful views. Instead, I wish he had shown the regression results for partisanship and ideology and Tea party membership for each of the nine survey questions. That would more clearly show, I think, just what element in the “racial resentment” index most clearly differentiates Tea Partiers from other groups. 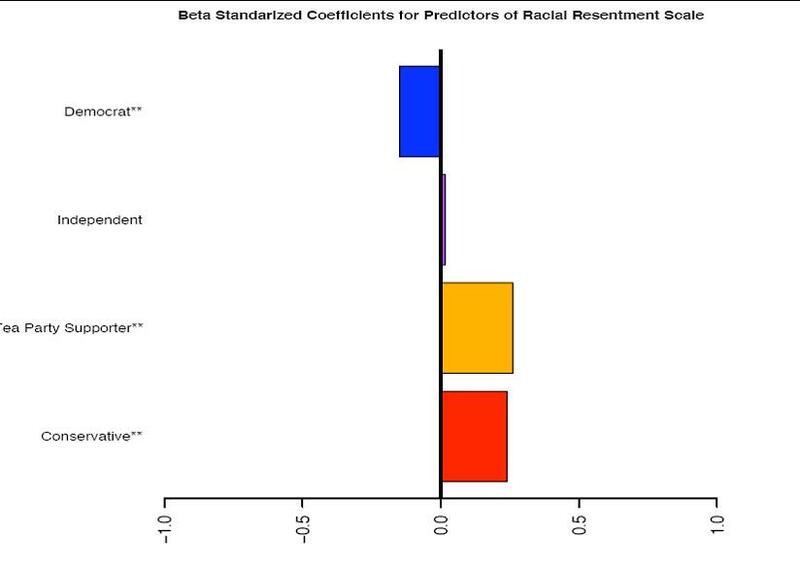 Finally, one might have also preferred that his regression predicting whether one holds racially intolerant views controlled for some basic demographic variables (age, gender, income, etc) that might influence results. Had he done so it is possible that some of the effects he attributes to being a Tea Party member will wash out. In Parker’s defense, however, he’s working with such small subsamples that it may be difficult to estimate more detailed regressions. At first glance, Langer’s results seem to oppose Parker’s. What explains the difference? I can’t be sure, in part because when I link to the study Langer cites, he presents the results but not the actual regression analysis. So I don’t know what regression he actually ran, or the coefficients, etc. Of course, both analysts could be right because they are not, strictly speaking, measuring the same thing. Langer is trying to predict what factors contribute to a decision to support the Tea Party, and concludes that racial views (however he defines this) is not one of them. Parker is trying to explain whether one holds views suggesting “racial resentment” and concludes that being a member of the Tea Party is a statistically significant predictor of having this attitude. These methodological concerns notwithstanding, I think Parker’s results showing the differences in racially-oriented views between these subgroups is very provocative, and it is as good as I have seen on this topic. Until better or more detailed surveys come around, it certainly deserves the coverage it has received (see here and here). But I think this coverage, such as the commentary by E.J. Dionne and Charles Blow – indeed, almost everyone who has commented on Parker’s results – are missing the real significance of his findings. Let us assume for the sake of argument that the results in the table above should be taken at face value. Look more closely at the differences not just between Tea Partiers and “middle of the road” respondents (however they may be defined). Look also at the difference in views between the middle of roaders and the Tea Party “skeptics.” If you compare the differences, you find that for seven of the nine questions, the middle of the roaders’ view are as close or closer (keeping in mind the 3% margin of error in the responses) to those of the Tea Party than they are to the Tea Party skeptics! On three questions, middle respondents are much closer to the Tea Party, while on two they are closer to Tea Party skeptics. On the remaining four they are equally close to either set of outliers – Tea Partiers or Skeptics. Why is this important? Because when moderate voters (that is, Parker’s middle of the roaders) go to the polls, they don’t get to vote for their favorite centrist policy – they choose among two candidates, neither of whom may share their more moderate views. Parker’s results suggest that, given a choice between a racially resentful Tea Party candidate or one who runs on the Tea Party skeptics’ racial views, they may be more likely to support the Tea Party candidate. Keep in mind that the partisan purists on both end of the spectrum are the ones who are not easily persuaded to cross party lines and vote for the other candidate. It is the middle of the roaders who are most willing to do so. Moreover, this is based only on a survey that focuses on racial issues. It is not a stretch to imagine that on economic issues – jobs, government spending, the deficit – moderates may skew even more toward the Tea Party candidate if she’s opposed by a Democrat who voted in favor of the stimulus package, the Obama health care bill, and the bank bailout. This is something Sarah Palin has grasped much more quickly than the other Republican candidates: in a highly polarized environment in which support for the party in charge is dwindling, you don’t have to be in the center on all the issues – you just have to be the last opposition candidate standing when the voters opt for “change”. Look no further than Barack Obama to see the wisdom in this strategy. My point is that Democrats ought not to take any solace in Parker’s findings. Rather than dismissing the Tea Partiers as racists, they would do far better to address those factors they can potentially influence, particularly the policy ideas that are motivating, to a greater or lesser degree, this movement: government spending and the deficit, unemployment, and the general perception that government has grown too large and that the nation’s ruling political class is out of touch with the concerns of ordinary Americans. Ten states are holding primaries today, making it the biggest election day until the November general election midterms. Politico has a roundup of some of the key races here, so I’m not going to duplicate their coverage. Instead, I want to focus primarily on those races that seem particularly relevant to the two dominant election themes this election cycle that I’ve posted about before: the growth of the anti-incumbent sentiment (including but not restricted to the Tea Party movement), and the decline of the moderate middle in Congress. But there’s also an interesting gubernatorial race in Iowa that may have implications for the 2012 presidential election. Keeping these themes in mind, what are the most significant primaries today, and what will the outcomes in these races tell us, if anything, about November’s midterms? In Arkansas, two-time incumbent Senator Blanche Lincoln is in a tough fight with the more progressive Lt. Gov. Bill Halter. (This is the runoff election dating from May 18, when no one captured 50 percent of the Democrat primary vote.) Lincoln, you’ll recall, was one of the Democratic holdouts on the health care bill and she ranks as among the most centrist members of Congress – part of that moderate middle whose ranks have been depleted in recent years. Will she be the next to go? Note that Obama has endorsed Lincoln – in recent races that has usually spelled defeat for the endorsed candidate (although not necessarily because of the endorsement)! In Nevada, three Republican candidates are vying for the opportunity to take on Senate Majority leader Democrat Harry Reid come November. The current front-runner in the polls is Sharron Angle, who has the backing of most (but not all) Tea Party activists. In California, meanwhile, three-term incumbent Senate Democrat Barbara Boxer is viewed by some as vulnerable come November, making the outcome of the Republican primary in that state today of particular interest. Polls suggest that former Hewlett-Packard CEO Carly Fiorina is the Republican front-runner. Fiorina has deep pockets and if she wins the Republican primary she would give Boxer a very very tough race come November. Of course, with all the focus on the Senate, it is easy to overlook the House races. Several moderate incumbents are in danger of losing to more extreme candidates in the primary. One is Democrat Jane Harman, who represents California’s 36th district. She’s being challenged from the Left by teacher Marcy Winograd. If I can, I’ll try to do a separate post on key House races later today. Finally, in Iowa, both Democrats and Republicans are holding primaries to determine who will carry the party banner in the race for Governor. Whoever wins will be the face of the party come 2012, when Iowa will hold their highly-publicized presidential caucus. As a result, potential presidential candidates in 2012 have a stake in this race – they want to back the winner. On the Republican side, former Iowa Governor Terry Branstad has a lead in the polls over Bob Vander Plaats. Both Sarah Palin and Mitt Romney are backing Branstad. Mike Huckabee supporters Vander Plaats, his 2008 campaign co-chair. In light of Rand Paul’s recent primary victory, we should pay attention to those races in which the Tea Party has backed an anti-establishment candidate. The Nevada Senate Republican primary is one such race. But the Tea Party’s influence may be stronger in the less publicized House races that are down ticket. Part of the Tea Party’s problem, however, has been a tendency for its supporters to split their vote among many candidates. If I can do a post on the House races, I’ll try to identify those in which the Tea Party has backed a candidate. I welcome comments from the political junkies out there who may be more familiar with those races in which the Tea Party has been actively involved. Keep in mind that all these elections are taking place in what Gallup polling (see chart below) suggests is the most inhospitable climate for incumbents since the wave election in 1994. Stay tuned. I’ll try to post later tonight or tomorrow assessing the results and what they may portend for November. Are The Tea Partiers Racists? A few weeks back I posted a brief summary of a Gallup Poll survey that compared the views and backgrounds of those in the Tea Party movement with a random sample of American adults. As the first survey of the Tea Party movement, the findings were of particular interest to me since – without The Cable – I hadn’t paid much attention to the movement. I noted two important results from the Gallup survey: that demographically, Tea Party supporters did not differ dramatically from a random cross section of Americans, but that ideologically it was a distinctly conservative movement, with half of its support coming from the Republican Party. I concluded by noting that in its broad outlines, the Tea Party phenomenon echoed previous social movements in American history, almost all of which arose during time of economic uncertainty. The pushback by progressives against any notion that the Tea Partiers might be a broad-based social movement that share characteristics with previous political movements in American history is fascinating. Why does the Tea Party movement inspire such vehemence, founded on charges of racism, from the Left? Note that the fact that it is disproportionately white does not seem, by itself, to be a convincing explanation. Recall that the 1992 Perot movement, to which I compared the Tea Party movement, was even whiter, with one estimate putting the proportion of Perot supporters at 92% white. In fact, as this columnist acknowledges, in terms of race, gender and education, Tea Party members are almost indistinguishable from Perot’s followers. And both movements share a common policy platform consisting of fiscally conservative principles of small government, lower taxes and less spending. Any yet there was much less, if any, intimation from the Left that the Perot movement was fueled by racism. What explains the difference in perspective toward the two movements? For those on the Left, this is proof that the Tea Party movement is at least in part racially motivated. For Tea Partiers, however, the questions are not tapping into racial views – they are inciting policy views. They note, for example, that fully 73% of Tea Parties believe blacks and whites have an equal chance of getting ahead in society. Moreover, they point out that the Times poll also found that 65% of Tea Partiers believe Obama has treated blacks and white equally – not exactly evidence that the movement is dominated by racists. It is far more likely, Tea Party supporters suggest, that these questions are tapping views regarding affirmative action in schools, diversity in hiring, and other race-related public policies. Uncovering racial motives from survey questions is tricky business. (Next time you are at a cocktail party, ask all the racists in the room to raise their hands. See what I mean?) So, without accepting or dismissing either interpretation, let me suggest four additional reasons, listed here in no particular order, that might explain the willingness of those on the Left to ascribe racist views toward Tea Partiers, but not to Perot’s followers, despite the two movements’ almost indistinguishable racial composition and economic policy views. First, the Perot movement, like the Tea Party movement, directed its rage at incumbents. In 1992, however, the President was Republican, but Congress was controlled by Democrats. So the anti-incumbent fervor did not seem directed at any single party. In the same vein, Perot’s followers were not drawn primarily from one party, while the Tea Party is at least half Republican and its members share a distinctly conservative perspective. Perot, in contrast, drew heavily from moderates and liberals as well as conservatives. It is easier for the Left to brand a predominantly white movement as racially-motivated when most of its members don’t share the Left’s ideological views. Second, the fracturing of media discourse into many more ideologically-oriented sources on both cable and the internet, has contributed to an echo-chamber effect where those on the Left are exposed to an increasingly smaller, and more critical, view of the Tea Party movement than was the case in 1992 with Perot’s followers. These often consist of the more “newsworthy” pictures from protest rallies showing the crazier element in the Tea Party movement. These images are cross-linked with like-minded sites, adding to the prevailing view that the Tea Partiers carry guns and crosses and spit on members of Congress. Third, the Perot movement had a figurehead – Ross Perot – on which the media could focus its narrative. Indeed, one of the media frames in 1992 centered on whether Perot was crazy, rather than his followers! In contrast, it’s much harder for the media to develop a coherent and concise frame on a movement that seems so amorphous and unorganized and whose newsworthy events seem to be raucous rallies rather than statements of principle from the movement’s leader. This allows progressives like Dionne and others to step into the media vacuum and define the Tea Party movement themselves. Finally, one should not underestimate the importance of having an African-American president. Simply put, many progressives sincerely believe that much of the criticism against Obama from the Right is rooted in racism, just as many on the Right sincerely believe that progressives are using charges of racism as a convenient excuse to deflect the Tea Party’s genuine substantive concerns. Tea party supporters argue that it is simply easier for those on the Left to dismiss the Tea Party as a fringe movement rather than accept that it in fact derives its support mostly from those who are disenchanted with Obama’s and the Democratically-controlled Congress’ policies. Unlike critics on the Left (and their critics on the Right) I don’t pretend to know the motivations of the Tea Party movement. And, lacking access to the sampling procedures underlying many of these polls, I am more hesitant than others to make blanket generalizations regarding the Tea Party based on a single set of poll questions. I’ll leave it to others to cherry pick those results that fit their ideological predispositions. Instead, I want to suggest that trying to uncover the Tea Party’s motivations is not a very useful exercise. What we really want to know is whether Dionne and other progressives are right in asserting that the group will not have an impact in 2010. After looking at the polling data as a whole, I don’t believe he is – the Tea Party is a broad movement rivaling the Perot movement in strength and which is motivated by a very strong anti-incumbent fervor rooted in concerns about government spending and the deficit – the same issues on which Perot campaigned and won roughly one in five votes cast in the 1992 presidential election. Efforts to paint Tea Partiers as a marginal group composed of bible-thumpers, racists and denture-wearing geriatrics hoping to turn back the clock to the “good old days” are not very helpful to Democrats if it leads them to dismiss voters’ substantive concerns. Racist or not, the Tea Party movement is composed disproportionately of affluent, well educated white males – precisely the attributes of individuals who are most likely to vote in any election. In the absence of economic improvement, this bloc of strongly motivated voters, ranging in size from 15% to 25% of likely voters, may contribute to an electoral tidal wave in November’s midterms that could wash away the Democratic majority. An astounding 94% of the Tea Partiers surveyed in the NY Times poll believed it is time for new people in government (compared to 78% of all adults who believe this.) Twenty-eight percent believe Congress is primarily to blame for the current state of the economy, and 34% believe it is responsible for the budget deficit, making Congress, even more than Obama or Bush, the primary source of the Tea Partiers’ ire. At a minimum, this suggests the movement has the potential to swing a significant number of seats away from the Democrat Party, potentially making the difference between a Republican or Democrat-controlled House and/or Senate come November. It is still too early to make accurate predictions regarding the 2010 midterms, of course. But I think progressives do themselves a disservice if they dismiss the potential impact of the Tea Party movement.